The PPPL code, called XGC, simulates behavior of the ions, electrons and neutral atoms in the transport barrier region— or "pedestal"—between the ultra-hot core of the plasma that fuels fusion reactions and the cooler and turbulent outer edge of the plasma. The pedestal must be high and wide enough to prevent damage to the divertor plate that exhausts heat in doughnut-shaped tokamaks that house the fusion reactions. "How to create a high edge pedestal without damaging the divertor wall is the key question to be answered," said Chang. "That is a prerequisite for achieving steady state fusion." 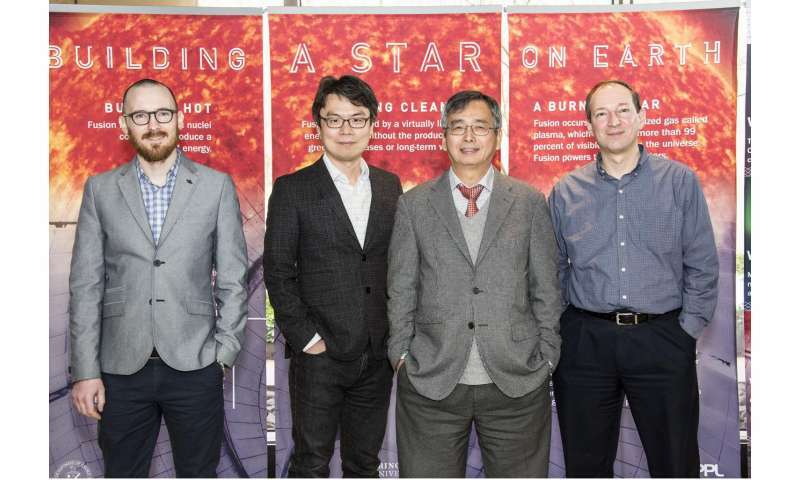 PPPL, on Princeton University's Forrestal Campus in Plainsboro, N.J., is devoted to creating new knowledge about the physics of plasmas—ultra-hot, charged gases—and to developing practical solutions for the creation of fusion energy. The Laboratory is managed by the University for the U.S. Department of Energy's Office of Science, which is the largest single supporter of basic research in the physical sciences in the United States, and is working to address some of the most pressing challenges of our time. For more information, please visit science.energy.gov. T;is' Moore's Law that will buy us the Holy Grail of energy production, steady state fusion. It makes sense. One day in the last century, some chap was abducted by aliens, the usual exobiological studies of species alien to the aliens......us! While on board, he was awake enough to be able to ask questions of his 'examiners'. One question was about energy production, whereupon he was shown their reactor, a device about as big as two suitcases and from his description sounded similar to a fusion reactor. A really compact one. From what he saw and was told, the energies in that device were put through an intricate dance. Our Wendelsheim 7-x seems similar but not nearly as compact. This reactor potentially put out energy similar to about a half a megaton of TNT, and ran its star drive, ship's power, and maybe other things. Der Deutschen Wendelsheim 7-x used extensive computer modeling in its design, and is just hitting its stride. Promises to be a good ride.